There are many ancient monuments and sites oriented to the current geographic pole, and this is called cardinal alignment or cardinal orientation. But what does it mean when more than 90% of the ancient monuments like pyramids and temples are not oriented to the current geographical pole? What is it that archaeologists and geologists have categorically overlooked? Fig. 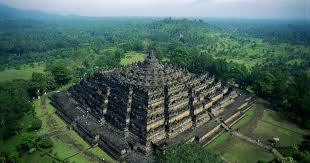 1: There are many ancient temples and pyramids oriented to the current North pole. Of the more than 910 selected structures in our database, 90 are exactly oriented to the current North pole. How coincidental is that? | © Mario Buildreps. Fig. 2: Tiwanaku (Kalasasaya) is cardinally oriented with ±0.2° accuracy. There’s much debate about Tiwanaku and who built it. Why Are Temples and Pyramids Cardinally Oriented? Around the world, there are many ancient structures, such as pyramids and temples, that are oriented in such a way that their footprint points precisely to the current North pole. The ancients built many of their monuments in the middle of nowhere. What would you do if you had the freedom to position a monument anyhow and anywhere? Unless you have no idea what you are doing, there is only one logical answer to that question: You would orient it to the geographical pole. It is also evident that there may be many other structures of importance that are oriented to the geographical North pole without an apparent reason. Pure symmetry between sunrise and sunset might have been one of these reasons. We happen to love the sun for many different reasons. Our article(s) might be tough for many of our readers. But when you can work your way through it, you will probably become aware that our history, the way it was taught to us, is very much in error. Earth crust shifts are real, and ancient monuments are much, much older than we are led to believe. By using mathematics, our real history reveals itself razor-sharp without any doubt whatsoever. 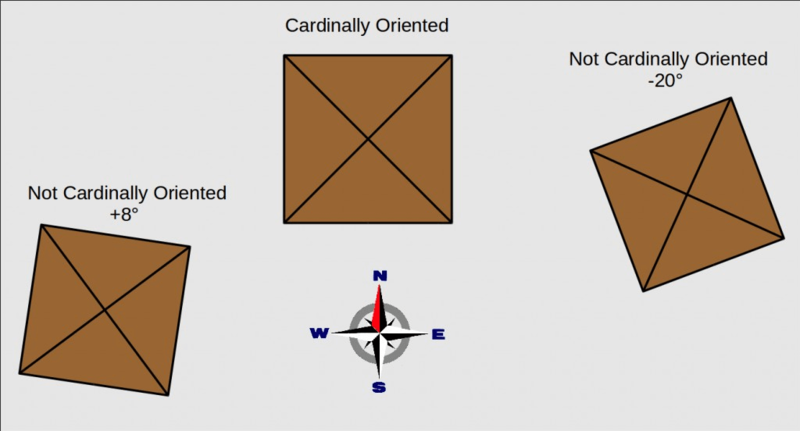 Why is Cardinal Orientation Important? Fig. 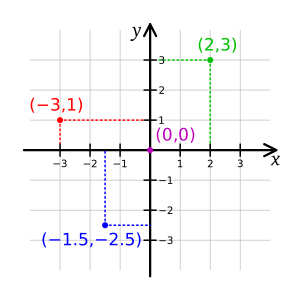 3: A Cartesian coordinate system is used to orient and to place positions in a grid. A cardinal orientation of a building has similarities, it makes it easier to orient to the Cardinals and to a certain direction. Imagine yourself to be in the shoes of an astronomer. There is a comet coming in one the Northern sky at an azimuth of 11 degrees. The building you are working in is just dumped down in the orientation of the street plan, and finding one of the cardinal directions is always somewhat of a guess. If your building was cardinally oriented, it would be much easier to orient yourself. That window looks out on exactly North. This door opens exactly to the East. This wall is precisely South, and that large window looks out precisely to the West. How much easier would you orient yourself? How much easier would a discussion between astronomer be if they exactly knew in which direction to look for this comet? 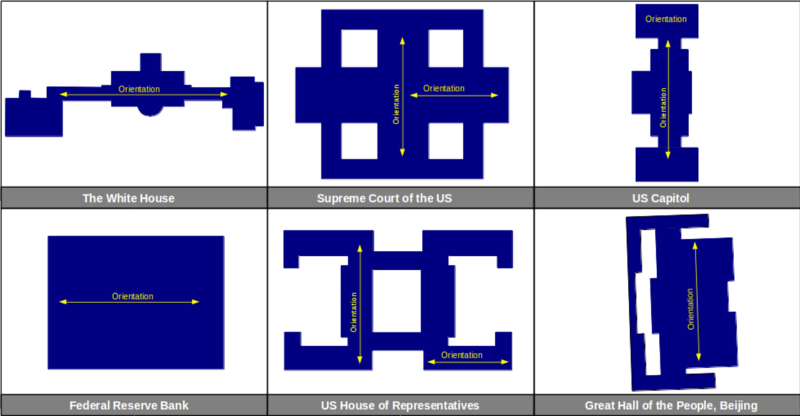 You can compare the cardinal orientation of a building with a Cartesian coordinate system. The X-axis goes exactly horizontal, and the Y-axis goes precisely vertical. Drawing a graph is easy. Orienting yourself in this grid is easy. If the grid is rotated to the whims of the day, it would be challenging and inefficient to draw a graph. The first thing you had to do is to study the orientation of the grid itself before you could start to draw anything. It would be very inefficient to work like this. So, when you want to study and predict solar cycles, moon cycles, solar eclipses, equinoxes, earth’s motions (obliquity, precession, eccentricity of orbit), or any other phenomena in the sky, you must point your instrument to the only sure point – the rotation axis of the earth. This would ultimately be the geographical North pole, or the South pole if you happen to live on the Southern hemisphere. If you do not do that, you will introduce another variable into the equations, and that makes them much harder to solve. The same goes for churches. Most religions regard the East as the place where the light is coming from. The Rising Sun. That is the reason why many churches are cardinally or almost cardinally oriented. But what does it mean when most of the ancient monuments are not oriented to the Cardinals, i.e., to our current North pole? How likely is it then that they were oriented to former North poles? This can be sorted out by using the power of mathematics. 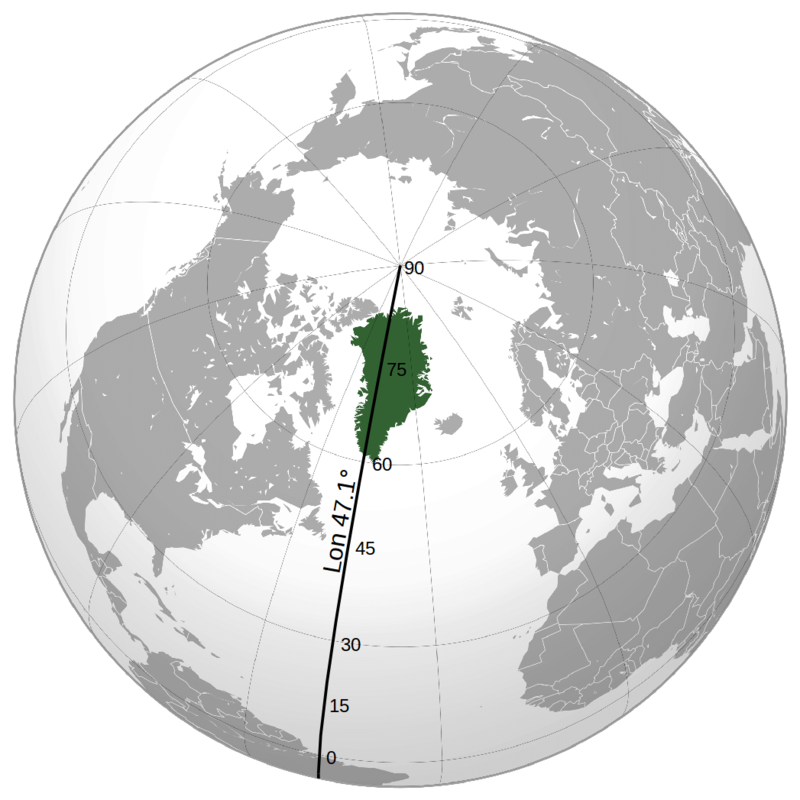 We proved that Greenland was the location of former (geographic) North poles. The structures that are oriented to these old geographic poles are therefore older than assumed by archaeologists. Because these pyramids from all over the world were collectively oriented to several locations on Greenland. That Greenland was located at the North pole is not a few thousand years ago. We are talking about hundreds of thousands of years. The foundations of most pyramids are older than 100,000 years. Their top layers might have been renovated many times – but the orientation was invariably left intact. An unbelievable conclusion that knocks down many paradigms. However, a lot of mysteries start to make sense. Our claim is extraordinary; our proof is exceptional as well. The mathematics behind our proof is exceptionally accurate and will be published in a book that is currently in the making. Belief systems resist change. We invariably believe that history, as taught to us, is correct. Even when mathematics and other evidence proves that conditioning is wrong, we tend to keep thinking that history, as it is pounded into our brains, is correct. This is what we call conditioning. A conditioned mind has trouble to interpret outcomes of mathematics that deviate from the programmed beliefs. No matter how solid the proof is, we tend to fall back into our old assumptions of the trusty old paradigm. To get used to another idea and to muster the will to overcome denial takes much time and effort. Fig. 7: Borobudur is probably one of the most accurately oriented temples in the world – within ±0.1° accuracy aligned to the current North pole. The question is: What is the probability that 90 of the randomly selected global 912 (ancient) structures are coincidentally oriented to the current geographic pole (within a range of 3 degrees)? 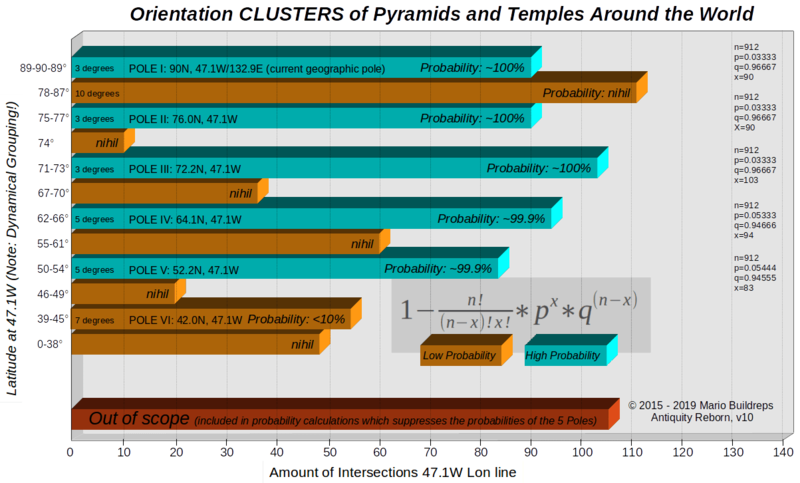 The probability is a whopping 1 to 6.15×1018, which is an incredibly small chance that this is the result of some coincidental process. What does that mean? It means that the orientation of many structures to the geographic North pole is NOT coincidental. Hence, it was done intentionally. The reason? Why is the White House perfectly oriented to the Cardinals? Or why are the Taj Mahal and the pyramids of Giza perfectly cardinally oriented? Or why is the Vatican cardinally oriented? 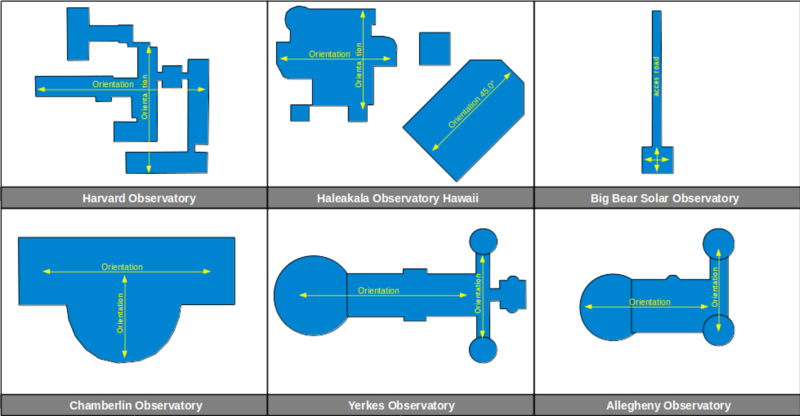 Or why are most observatories cardinally oriented? The architects of these structures understood the importance of cardinal orientation. We can be sure that the orientation of these 90 temples and pyramids was done on purpose, and therefore we can say with 100% certainty that the geographic pole is where the orientation of these pyramids and temples is based upon. It is crucial to grasp this part. We can extend the same methodology to the 90% other ancient structures which are not cardinally oriented and examine how they relate to each other. With our method, we are able to discern former geographic poles from the orientation patterns of these ancient structures. Our powerful mathematical method delivers 100% proof of former geographic poles. Our history is not what it seems to be. The earth has four Lost Civilizations over the course of only 350,000 years. Fig. 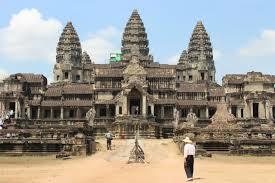 10: Angkor Wat is oriented within 0.2 degrees to the current North pole. When you want to prove a theory of this magnitude, it makes no sense to pick just any structures. No, the structures you must pick need to be monumental, big, ancient, imposing, and perhaps religious in nature. You would not want to pick some random buildings, such as the Notre Dame in Paris or another cathedral somewhere. Did you know that the Vatican is almost perfectly East-West oriented, and therefore oriented to the current geographic pole? Whatever the reason was, it seemed important enough to orient it this way in the middle of a crowded metropolis. But the Vatican is not on our list – it is much too young. Selecting just a random church in the middle of a town proves nothing. The location of the sun and stars did not matter for them, let alone the North pole. The church had to be placed in the spatial limitations of its surroundings at that time. After years of hard work, we have been able to allocate more than 900 ancient sites spread around the world. Every ancient monument or site is carefully administrated with location data, orientations and calculations. The latest LIDAR scans in Guatemala have revealed massive ancient cities with pyramids and temples which are without exception oriented as we have predicted with our method. We have dated these cities with our method to be much older than archaeology have been telling us. In fact, they belong to one of the many Lost Civilizations. During our research, we found 4 other orientation clusters. An orientation cluster is an indication of a possible former geographic pole. To be certain about the validity of individual clusters, much more research was done to come to an ironclad conclusion. You might want to read the other articles on this website to get a full picture of the method we used. Pyramids from all over the world are oriented to just a few locations that form data clusters on a so-called NORTH-SOUTH reference line. This line is explained further on in this article. Some sites in Mexico comprise a large collection of pyramids that are criss-cross oriented as if they were just dumped somewhere. But the chance that a few structures on one site cross other alignment clusters are very, very small. It is almost zero. But if that occurs, it means it was not accidental. Some of the structures on the ancient site were reoriented to another pole. These sites can be interpreted as sites that were rebuilt after a catastrophe – a crustal shift. These structures can tell us an interesting story of what might have happened in the past. We know where the current geographical North pole is located. 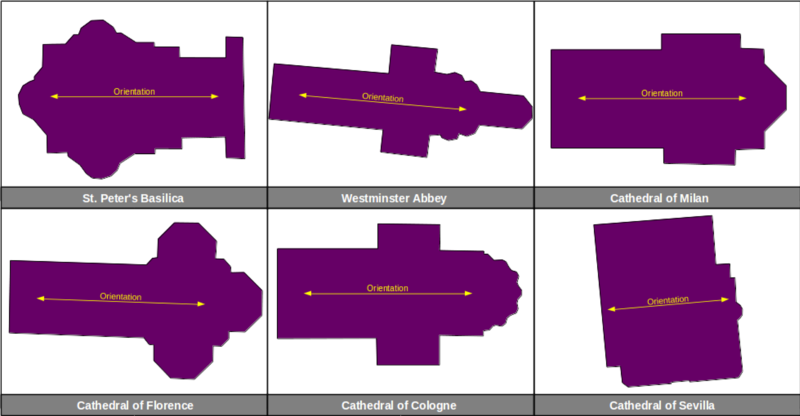 In Google Earth, we can measure the angle of orientation with which structures were built in relation to the geo pole. In this way, we can verify the accuracy of our measurements. 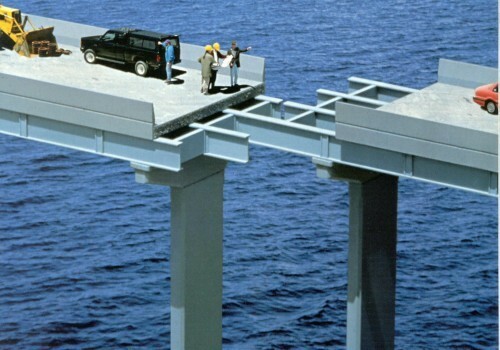 The first thing you need to know is how accurately a structure can be measured in Google Earth. Take for example the Great Pyramid of Giza. We know it is almost perfectly aligned to the geo pole (within ±0.05°). So, we can base our methodology on this. 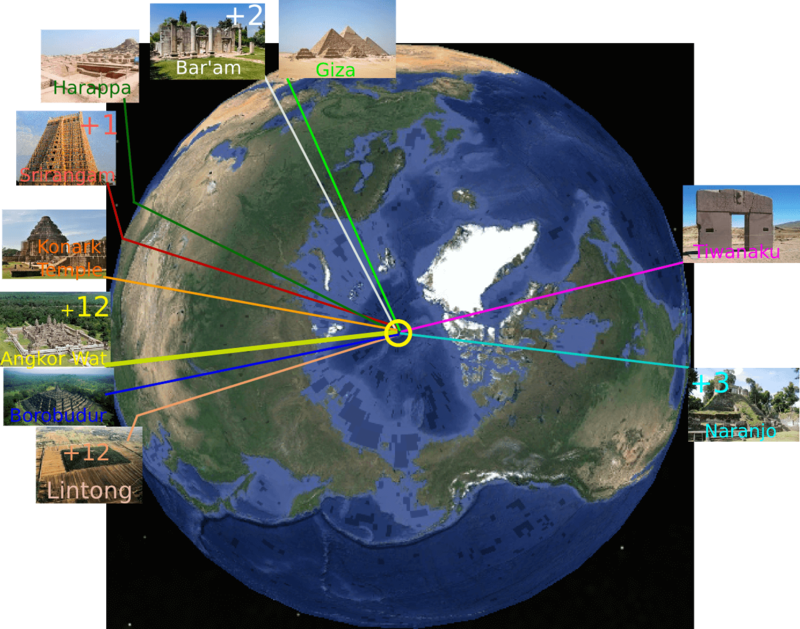 Experimental measurements on different parts of Giza showed that the average accuracy of measurement of Giza in Google Earth resulted in an error of ±0.20°. The pyramids of Giza are relatively easy to measure; the satellite footage is sharp and the bases of the pyramids are relatively clear. There are structures which are more difficult to measure accurately because of blurry satellite footage, or the angle under which the objects were photographed was not vertical (the baseline is the safest area to measure). For some of these sites, archaeological maps with a North arrow indicator were used as a cross-reference to verify the outcomes of the measurement in Google Earth. 3σ (99.7%) was accepted as reliable enough for the calculations: ±1.5°. This also includes the error of measurement and glitches in the footage. Although Giza could be measured much more exactly, only ±1.5° (total angle is 1.5+1.5=3.0°) was accepted as the standard accuracy for the whole project, and that counted for Giza as well. Fig. 12: Accumulation of errors can result in disasters. When the pyramid builders established the geo pole many thousands of years ago, they made a little error in their measurements. 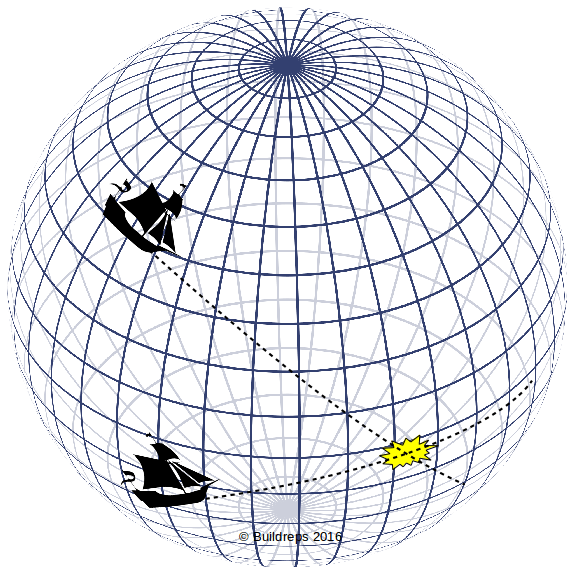 Even with our GPS systems today we must deal with a potential error of about ± 15 meters. When the pyramid builders constructed their pyramids, they again made a small error between their perception of true North and the actual orientation of the stones. When we measure the pyramid many thousands of years later, the position of the pyramid might have changed a little bit, due to geological processes, especially when earth crust displacements appeared to be at work. When we measure the pyramid many thousands of years later, we again make small errors in our measurements. It is possible that all these errors cancel each other out and nicely turn out to be perfect, but it is most likely that we will find an erratic pattern of ‘noise’. This noise is the accumulation of the above-mentioned errors, and is ultimately the root of the sum of squares: the combined error Δn = (√(x12+x22+x32+x42 …+…xn2). The chance that one of the pyramids of Giza is oriented cardinally by coincidence is 1 to 30 (90÷3.0). The chance that all three of them are coincidentally oriented to the North pole is almost ZERO. To be exact: 0,0037% ((3.0/90)3 × 100%). Therefore, Giza’s orientation was certainly no coincidence. The claim that all three were meant to be oriented to the current geographic pole is 99.9963% sure. Most pyramids have four sides. Since we do not know for certain the purpose of a pyramid, we cannot discriminate one side over another. So, the angle in which it can be uniquely arranged is 90° (360°÷4). We cannot tell which orientation regarding the geographic pole has a higher priority, so we can only define structures 45 degrees left of the geo pole and 45 degrees to the right of the geo pole. This is the mathematical unambiguous basis for our method. 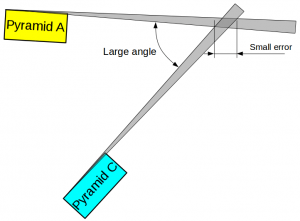 With the average accuracy of ±1.5° with which we could measure our chosen structures, there are certain discriminating steps within the angle of 90° 30 which creates a standard chance of 3.33% in the defined methodology that a pyramid is accidentally pointing to the North pole. There are currently 912 measured structures in our database. Hence, it follows that we can count on a standard chance that 30.4 of these structures (912×3.33%) are pointing North. Thus, when we find 30 structures clustering within an area of 3 degrees along the intersection line we cannot claim a special status based on that. But when this number of random clustering approaches 40, 50 or even 60, the probability of coincidence rapidly diminishes towards ZERO. We can distill from these combined patterns the conclusive proof that the crust, ultimately the North pole, has shifted and that pyramids are much older. Why much older? Because such a devastating and catastrophic event would not have happened completely unnoticed over the last several millennia. Of the randomly selected structures, there were 90 ancient structures in the database pointing to the current geographical North pole. As we have already shown above, the chance for this to be mere luck is ZERO. When another cluster of this magnitude shows up, it is surely one of the former North poles, with a certainty of almost 100%. Let us have a look. We can find former geo poles by following the orientation patterns of ancient structures and by calculating the probability that it is a former geo pole location. We follow the patterns of pyramid orientations which are not pointing to the current geo poles. But since we only know the current geo poles for sure, and we are uncertain where to look, it is best to go from coarse to fine. If there are hints that the former geographic North pole might have been on Greenland, the first thing that could be done is to look for the number of orientations that intersect on Greenland as a whole. The number of (ancient structural orientations) intersections on Greenland is 410 of the total of 912. The probability for such a large amount of data to cluster in such a way is ridiculously small: 1 to 4,16×1038. We can be very confident that a former geo North pole was somewhere on Greenland. Or better, Greenland was once situated on a former geographical North pole. We can claim this with 100% certainty, even if we do not know anything about geology, archaeology, or some other scientific discipline. We do not have to drill holes and do all sorts of fanciful looking expensive research. We do not need to fly with helicopters over glaciers, or other useless sorts of research. We only need mathematics to find the highest potential of truth. We do not know yet where to look at Greenland. That can be done by following simple logic. How? 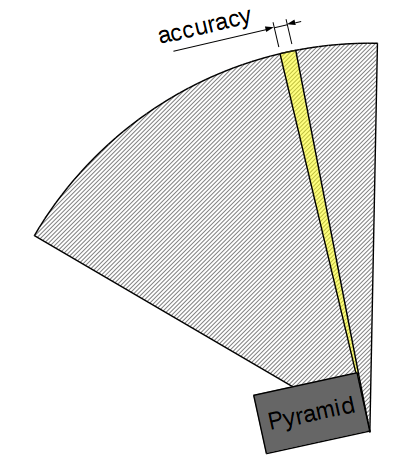 By connecting the pyramids by using an ‘independent intermediator’ – an intersection line. This line represents the rough path the pole took over the last 400,000 years. Why Not Connect Pyramids Directly? It happens often, especially on the internet, that people claim to have found a connection between ancient objects by drawing some lines between them. In most cases that means absolutely nothing, and we cannot draw any conclusions from that. With 912 pyramids we can have ½×(9122-912) potential unique connections. There is however not always a connection point formed between two structures, simply because there is no mathematical solution. With 415,416 potential intersection points, it would be an immensely unreadable scatter plot with over 90% of useless noise in it. We have nevertheless done all these researches, which you can find on our website. Our research is vast and deep, and we are still extending our research because we have found the ultimate key to so many questions. We can find an intersection point between two of the most enigmatic pyramids on the planet, Teotihuacan, and Giza. They intersect near Kongsfjord located in Northern Norway. We will find nothing useful at that location. Perhaps even more importantly, we would not know why these pyramids and temples were “un-cardinally” oriented, to begin with. The intersection lines of ancient structural orientations will lead to clusters of pyramids that we can safely group together leading to a definitive location of a former pole, a node of sorts. We can calculate the probability of such a node to form coincidentally. All the pyramids clustering around the same node belong to the same period. For example, on the reference line, we found 102 intersections between latitude 71 and 73. The standard probability is 30 intersections. We can calculate the likelihood that such a large cluster can be formed coincidentally by using the binomial formula. The probability that a data cluster of this magnitude is formed coincidentally is 0%. There is no team of scientists, no matter how large and how well funded, who can beat this number. Conversely, we can say it is artificially constructed. Why? Because the probability it was intentional is ≈ 100%. All these randomly distributed ancient structures were clearly pointing to one location, namely to a former geographic North pole because the geographic pole is the only transcending geographical feature wherever you are on the globe at any given time. The same situation was emulated by using Monte Carlo simulations, which gave the same results. We can be sure this method expresses this situation correctly. Another item becomes clear when we look deeper into this issue: The older the cluster, the larger the area over which a dynamic group is formed. It might sound difficult, but it is easier than it seems. The older the geo pole to which certain pyramids were once oriented, the more deformations the crust had to endure. Plates were apparently deformed and thus also the accuracy of the oriented groups of related pyramids. They form a group over a larger area. This mechanism shows itself in a larger spread of the oriented pyramid to this ancient geo pole. From this, we can approximately recalculate the amount of deformation of the tectonic plates due to the crustal shifts. Crustal shifts enabled Greenland to migrate in several steps over the North pole. It is possible to correlate the magnitude of the steps with the temperature proxies δD or δ18O respectively found in ice cores of Vostok and Dome-C (Antarctica). The similarities are clear. From this, we can directly derive the time frames of the crustal shifts which are clearly related to the Milankovitch cycles. The article on the main page tells the full essence of this theory and its exciting discovery. This is my belief…a large asteroid struck the earth at a very oblique angle and formed most of what we call the Hudson bay. Due to the protection of the massive ice sheet, what would have been a deep crater became more like an shallow impression. This impact caused the near-immediate extinction of almost all the megafauna and of most human civilizations flourishing at that time. 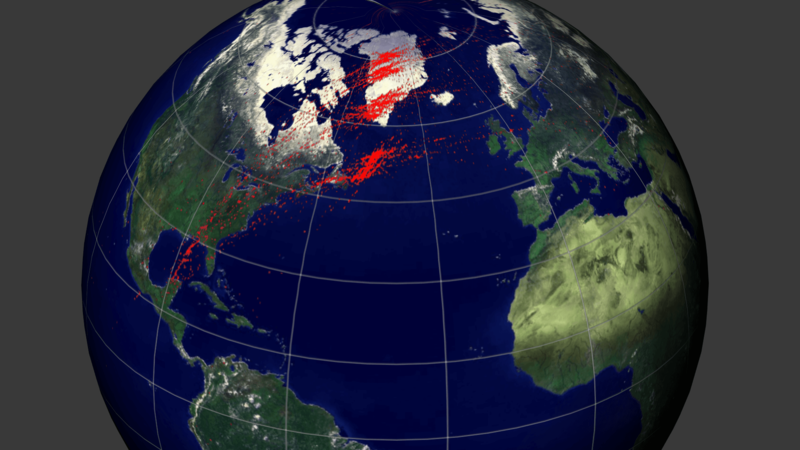 Due to the very oblique nature of the impact near the top of a spinning globe, the north pole shifted in one jolt from central Greenland to its current position. The angle of the Hudson Bay impact crater confirms this glancing blow….as does the lack of an ice sheet over Siberia during the last Ice Age due to it being at a lower latitude. The majority of the crater’s pulverized material rained down on the ice sheet and into the Atlantic ocean (much of that debris field now being erased by 1000’s of years of sea-floor spreading). Some of the debris made it into Africa and Egypt…explaining why King Tut’s dagger was made of meteorite material and why Muslims still worship a meteor fragment. The debris landing in the Atlantic ocean caused a tidal wave and wiped out the Atlanteans who lived near the Atlas mountains of Western Africa. The survivors AKA the “new” pyramid builders had to adjust their temples to face the “new” North pole…and they all had to add 5 extra days to their calendars as the Earth now moved a bit more slowly around the Sun. The earth has a 30km buldge of water at its equator. Sounds like this buldge would have been along a different axis in the past. Do you know this? I’ve done the math with a computer program. If correct Mauritania would have had an ~14km lower sea level for example. Good point, John. Indeed bulges the Earth somewhat around the equator making the Earth an oblate spheroid. It is not only the water that bulges, it is also the seabed and the landmass that bulges along with it. The oceans bulge more easily and dynamically than landmass, but if you give it some time the landmass will follow. We are looking for ways to develop a complete model for the changes that the Earth had over the last 400,000 years. Why is it difficult to model? The Earth has grown a bit (we suspect between 10 to 15 km over this 400,000 years), the geographic South pole hasn’t moved much, the geographic North pole underwent massive changes. Hence are the locations of the ancient equators during these North pole migrations not very easily solved. Thanks i understand things better now. Stable south pole and instable north suggests north crust movement and not a global spin axis change. Very interesting- but my question is where did this original knowledge come from and spread all around the globe before the internet and GPS and air travel. There must be a common source of knowledge that was given to all these pyramid and temple builders. My guess is an external – ET off-planet source. Thank you for your comment, Julian. Homo sapiens walks around the planet for more than 400,000 years in the same shape and same intelligence as we today. 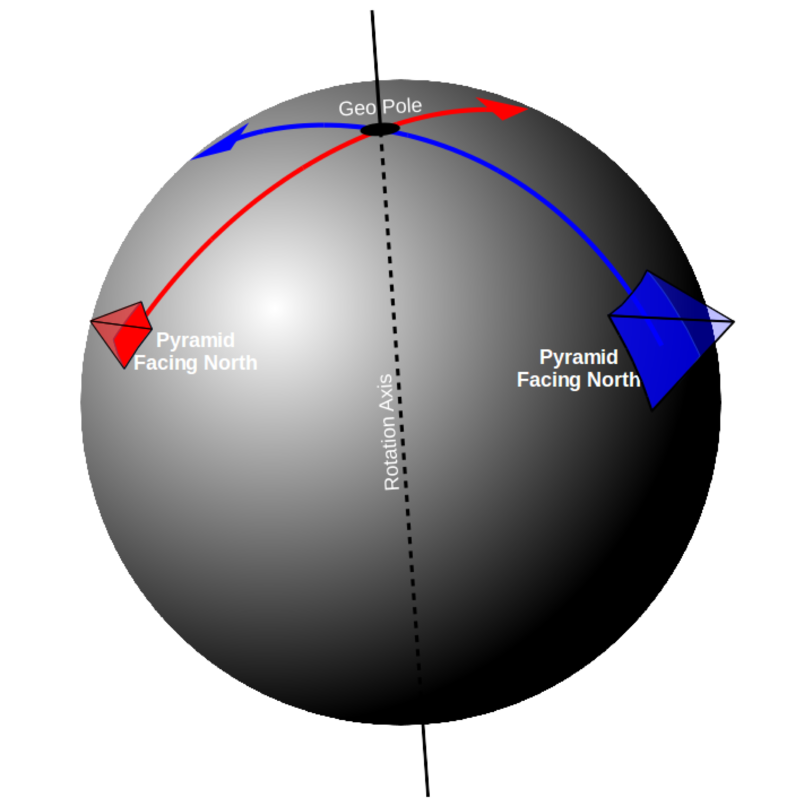 Crustal deformations that caused the geographic North pole to migrate also caused changes in the cardinal directions and in the solstices (because of changing latitudes). Our ancient ancestors were as curious and intelligent as we are so they studied the movements of the Sun and the Moon, hence we see a pattern arise of changing orientations of ancient structures over the millenniums that appears to match exactly the variations of the glaciation cycles over the last 400,000 years. We have found convincing evidence that the human DNA was manipulated at around 420,000 years ago, probably by “visitors from the sky”.